From Dana Lyons: High Beta stocks may be losing their key leadership status. In analyzing risk in the market, we predominantly rely on quantitative models that we’ve developed over the years. There are, however, other indicators that we monitor which we’ve found helpful in instructing us as to the “risk-on” vs. “risk-off” situation in the market. These indicators can provide helpful clues as to the potential strength or durability of market rallies. 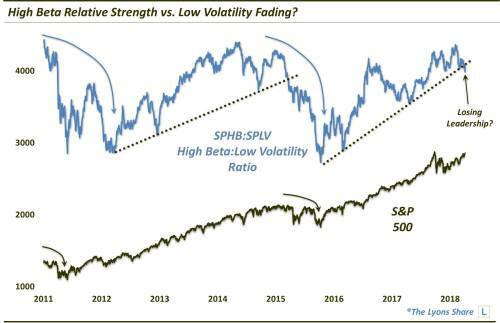 One such risk-on indicator can be found in the “high-beta” area of the market – especially in its behavior relative to “low-volatility” stocks. To track these groups, we use the Invesco S&P 500 High Beta ETF (SPHB) and the Invesco S&P 500 Low Volatility ETF (SPLV). We have found that typically when the ratio of SPHB to SPLV performance is rising (e.g., 2012-2015, 2016-2018), it is an indication of “risk-on” – and constructive for the prospects of the overall market. When the ratio turns lower (e.g., 2011, 2015-2016), we’ve found the opposite message to be true, i.e., “risk-off”. This chart illustrates that idea. What’s the current message being sent by the ratio? As one can see on the right of the chart, the SPHB:SPLV ratio is threatening to break its post-2016 uptrend. While it’s too soon to decisively reach that conclusion, we would argue that such a development would be a negative for the prospects of a continued, durable risk-on move in the stock market. In a Premium Post at The Lyons Share, we review the current status of our set of risk-on/risk-off indicators to reach a more comprehensive picture of the market’s risk situation. The SPDR Dow Jones Industrial Average ETF (DIA) closed at $253.30 on Friday, down $-1.86 (-0.73%). Year-to-date, DIA has gained 3.25%, versus a 6.53% rise in the benchmark S&P 500 index during the same period.